← An Irish Garden in the “World’s Top 10”. 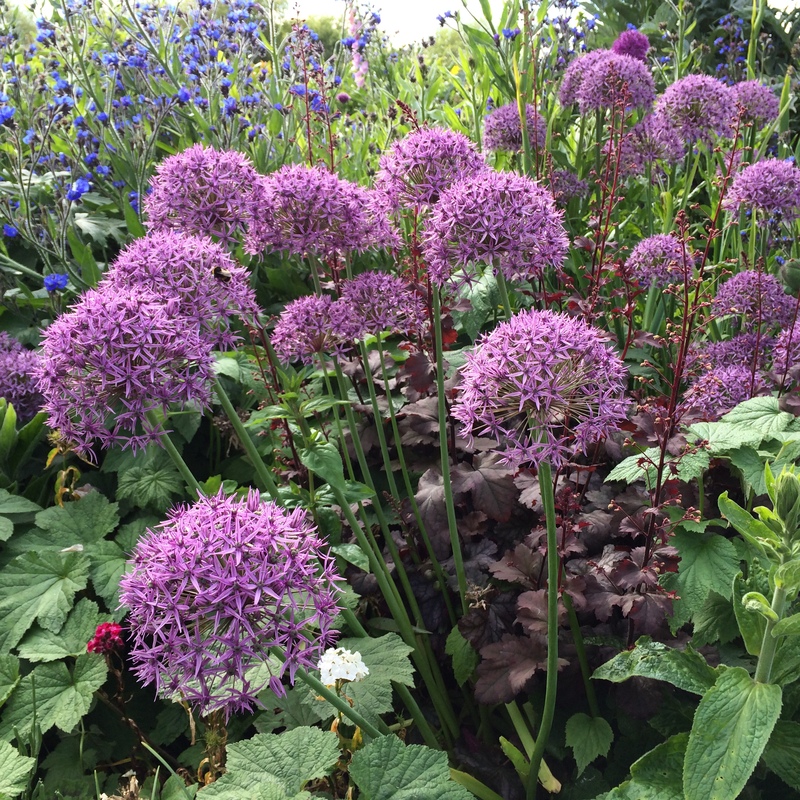 At this time of year, I love to see the purple heads of Alliums introducing some fizz to the borders whilst we wait for the drama of perennials to come.Their tall heads sway in the breeze but remain remarkably upright adding much needed height. 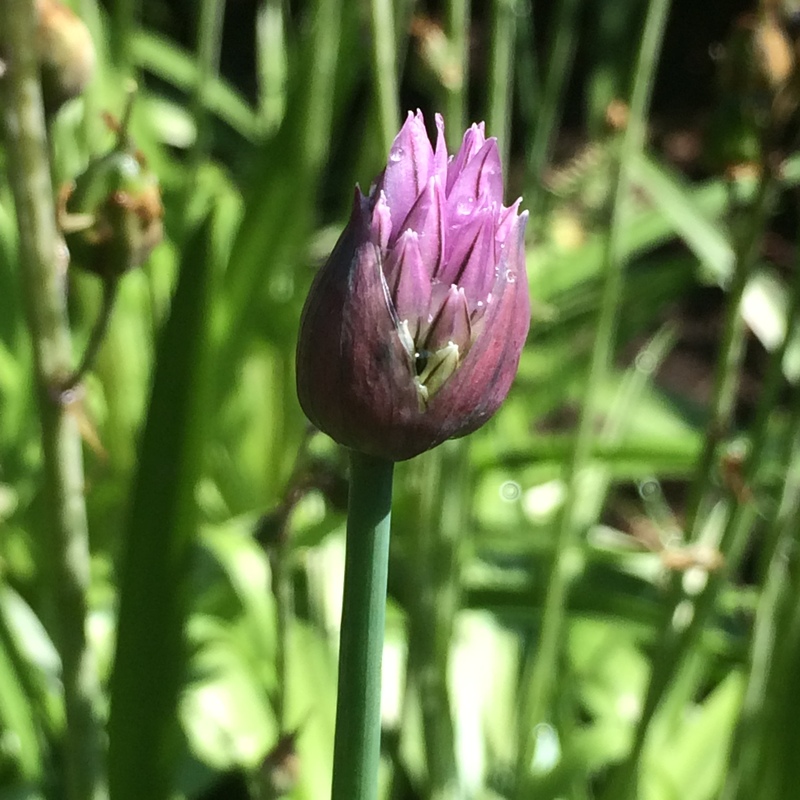 The Allium family encompasses the edible shallots and onions (Allium cepa), garlic (Allium sativum) and chives (Allium schoenoprasum). The edible herb : Chives. 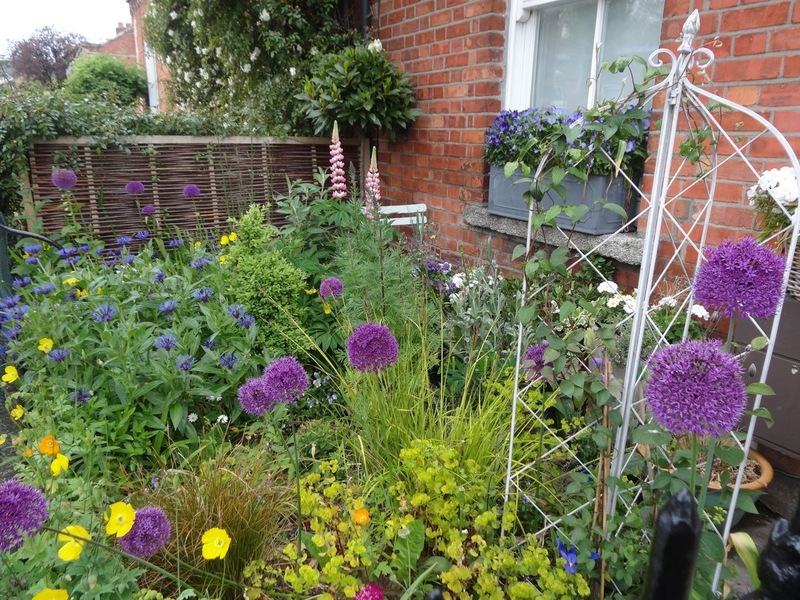 But the Alliums we plant in our flower borders are often referred to as “ornamental onions”. 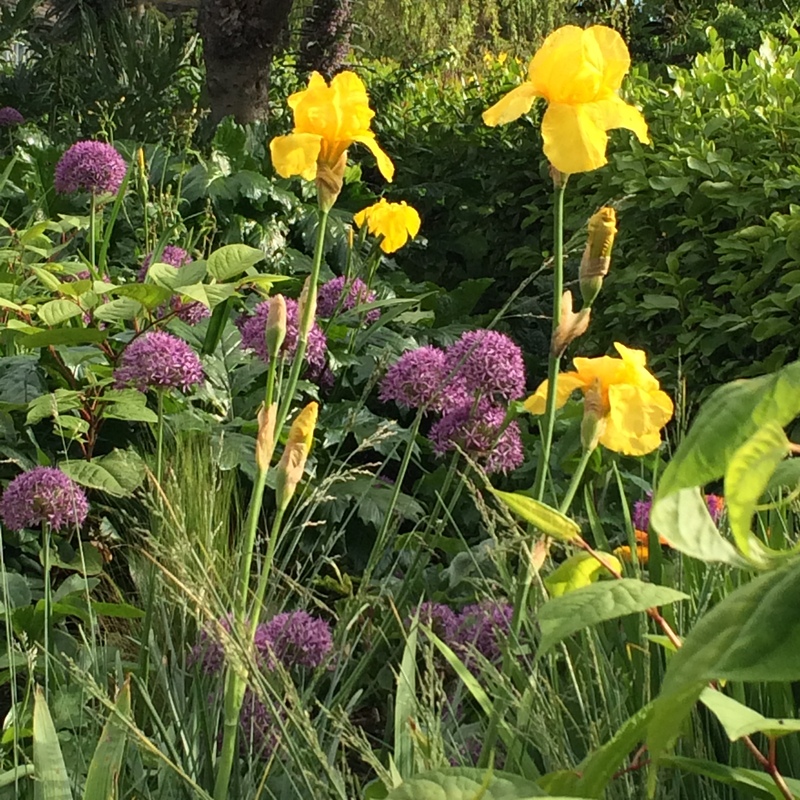 They are easy to grow bulbs, planted deeply in the autumn in well-drained soil; they do not require much space, their heads rising up on strong stems, ‘scapes’, held aloft above the emerging perennials. 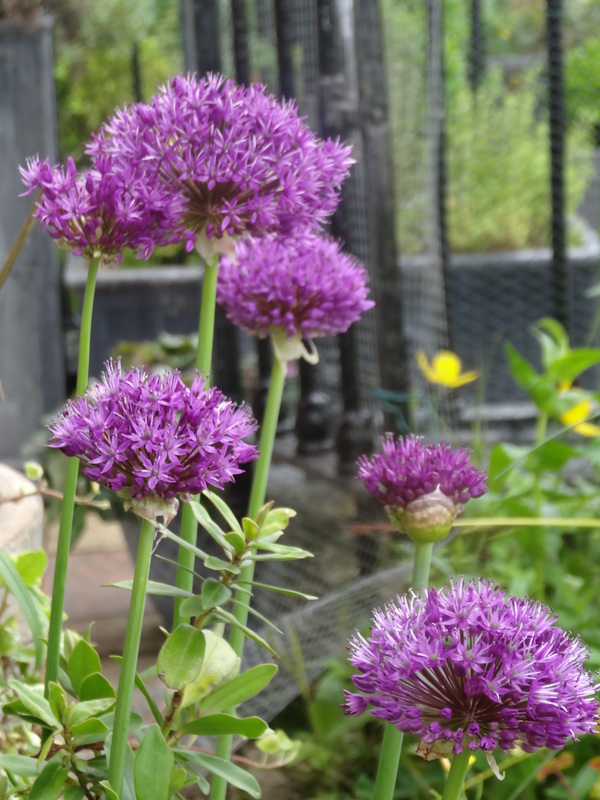 They are drought-tolerant and come in a range of sizes and shades – purple, white, blue (Allium caeruleum) and yellow (Allium moly). 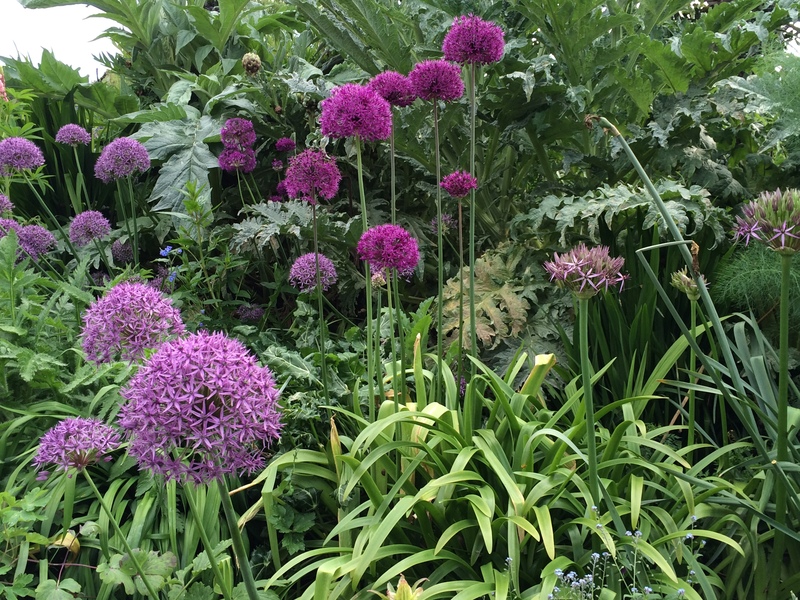 They are often the mainstay in early summer Show Gardens – in 2014 purple was certainly the colour of choice at the Chelsea Flower Show – as they are showy, easy, and flower in early summer. Purple is certainly my colour of choice, but it can look a bit flat and dead on its own. or with its complementary colour, yellow, for strong impact. 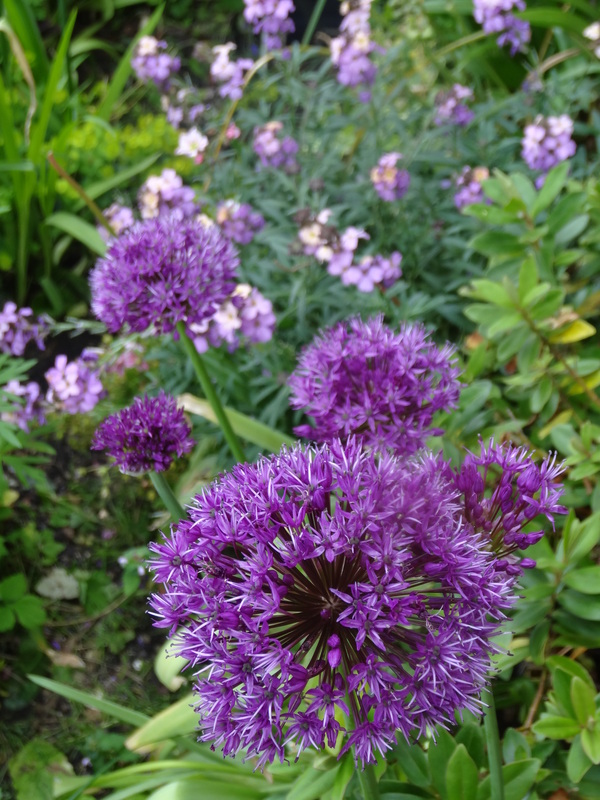 The well known Allium hollandicum ‘Purple Sensation’, a lovely rich purple with smaller heads. 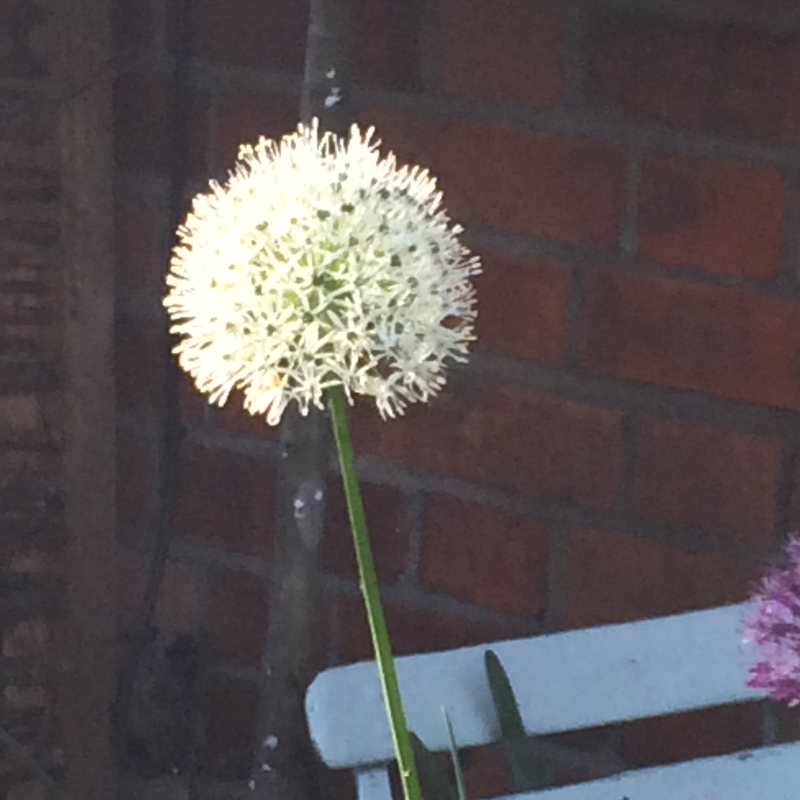 The statuesque Allium stipitatum ‘Mount Everest‘ is pure white. 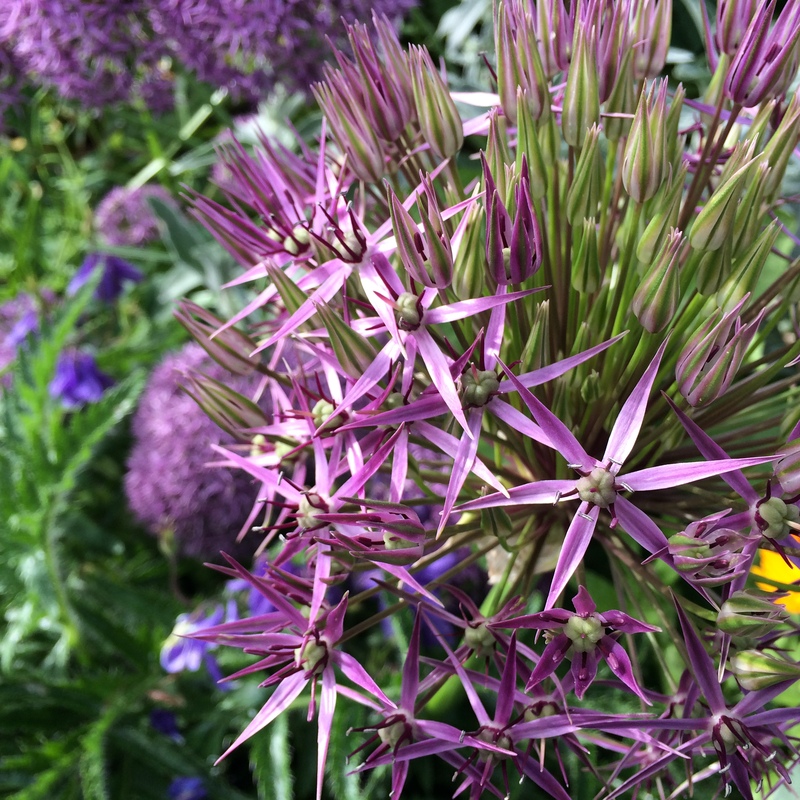 The dramatic Allium ‘Globemaster’ stands tall in the border with lovely deep-violet heads. A. Globemaster with A. Purple Sensation and A, cristophii. 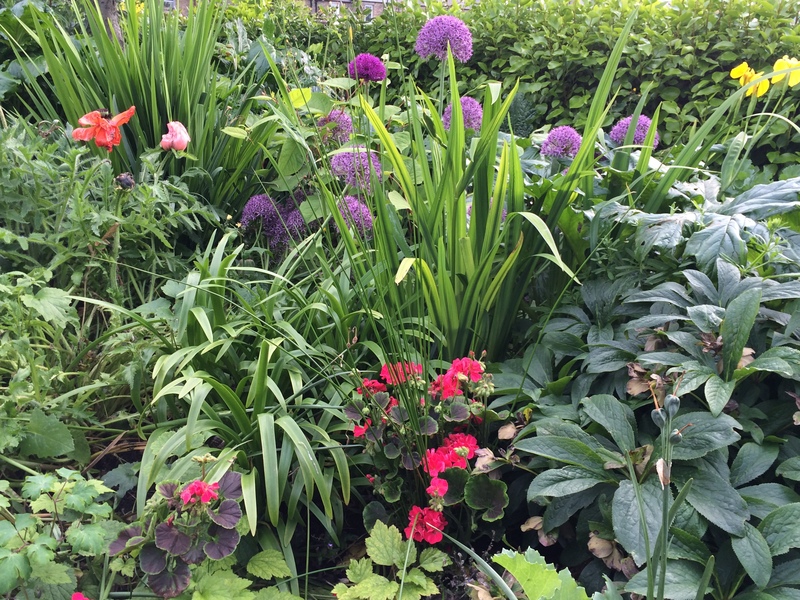 Alliums suit all styles of garden, from formal to cottage, traditional to prairie and even in deep pots on a balcony. 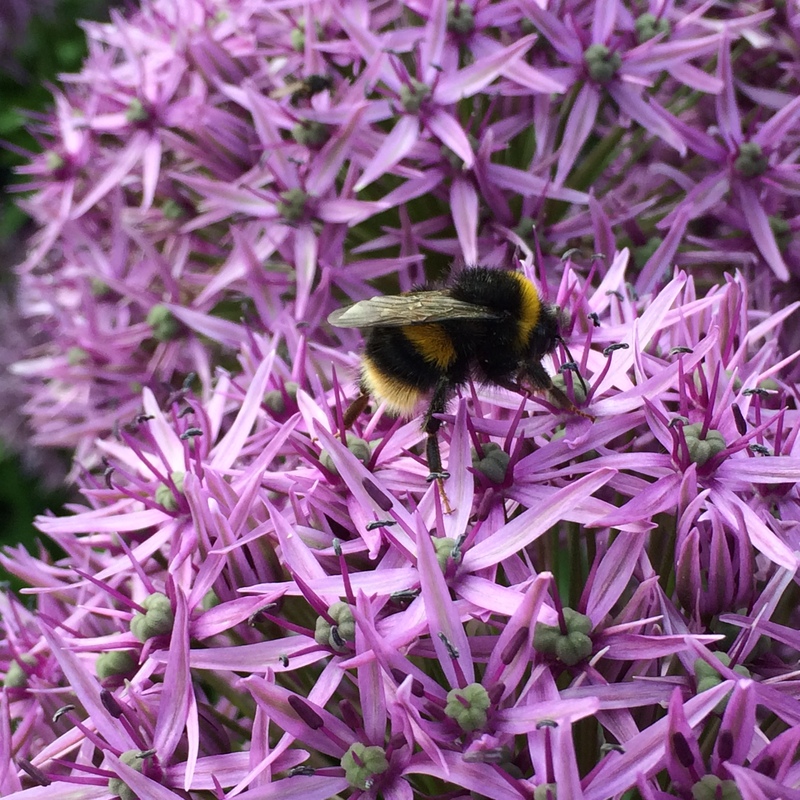 So pleased you posted about alliums, they are my absolute favs, and so popular with the bees. I’ve noticed ours this year have come and gone quite quickly, mostly because I had to lift them from the ground earlier in the year and stick them in pots and I think they much prefer the ground. Thank you so much Sophie – glad you liked the pictures. 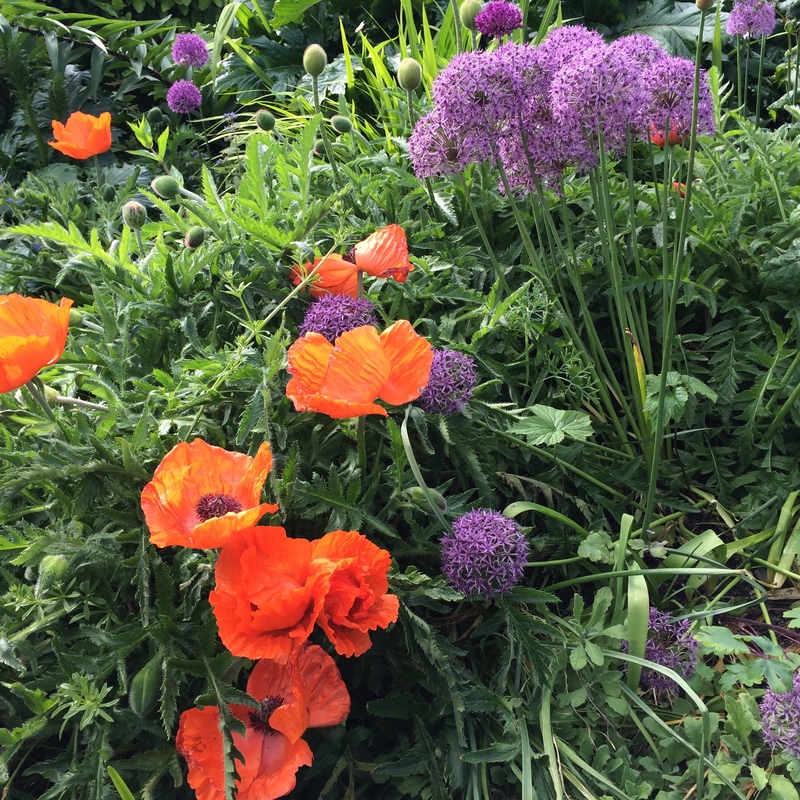 I love alliums too – last night the bees were all over mine. We’ve had loads of rain but thankfully they’re still upright! Stunning photographs of a beautiful plant. Thank you Victoria! I love alliums & glad the photos did them justice. i planted alliums along my walkway, intermingled with cumin – can’t wait to see how the imagined white and purple actually turns out! Interesting. I’ve never been able to grow cumin – don’t think it suits our climate. Hope it all looks good. All of the photos are so colorful — I love the way you start with purple, and then expand on it. Nature’s colors are so vivid and beautiful! Thanks Cindi – glad you liked the photos and posts. At the Bloom Flower Show today the Stand with Alliums won Best in Show.